Want to get the Plainsman monthly informational email? With stuff like you see here. Wowzers! These are actually hand-made, not thrown on the potter's wheel. You can see the vertical join by the handle as it rotates. Her's is a simple concept: A red clay with a thin application of partially opacified matte glaze. She flaunts a bare red clay base, polishing it. You can find her easily on Instagram and google. Both of these were glazed by brushing. The inside transparent and white glazes are fairly easy to apply evenly but the bright color on the outside left one certainly is not. The problem is a combination of things. It is difficult to apply it evenly with a brush. It is difficult to get it on thick enough. And this commercial glaze does not contain enough of the purple stain (so I added 6 grams of Mason 6304 Violet powder to the 2/3 of a jar I had left). That, more careful brushing, and an extra layer produced the piece on the right! Teachers who have never worked with clay face a formidable challenge with this. This read-in-three-minutes page is a complete beginners crash course in what you need to know. It explains what clay is, the advantages of working at lower temperatures, how to plan and inspire the children before starting, how to join and dry pieces, what is glaze and how to use it and how to fire the ware. 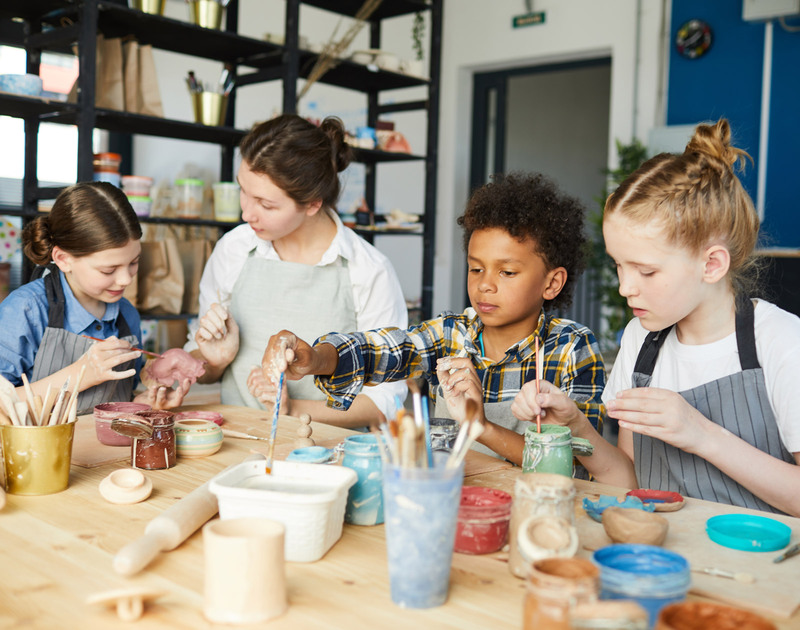 The page explains things with an objective that the reader understand the basic whats, hows and whys of ceramics and pottery. Low fire ware cracking during firing. Why? Most low-fire bodies contain talc. It is added for the express purpose of increasing thermal expansion. The natural quartz present does the same. 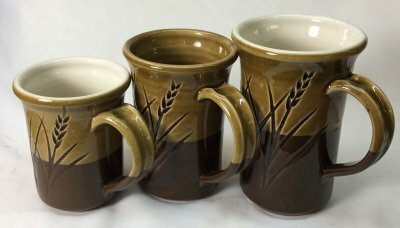 These are good for glaze fit but bad for ware like this. You could fiddle with the clay recipe or change bodies, but better to change the firing schedule. While stoneware dunting happens between 950-1150F on the way down, this could be happening anywhere. A simple fix is to slow down the entire cooling cycle. Learn to program your kiln. Use a conservative cooling rate of about 200F/hr (even slower between 950 to 1150). No electronic controller? Learn a switch-setting-schedule to approximate this down-ramp (buy a pyrometer if needed). Want bright orange on your ware? 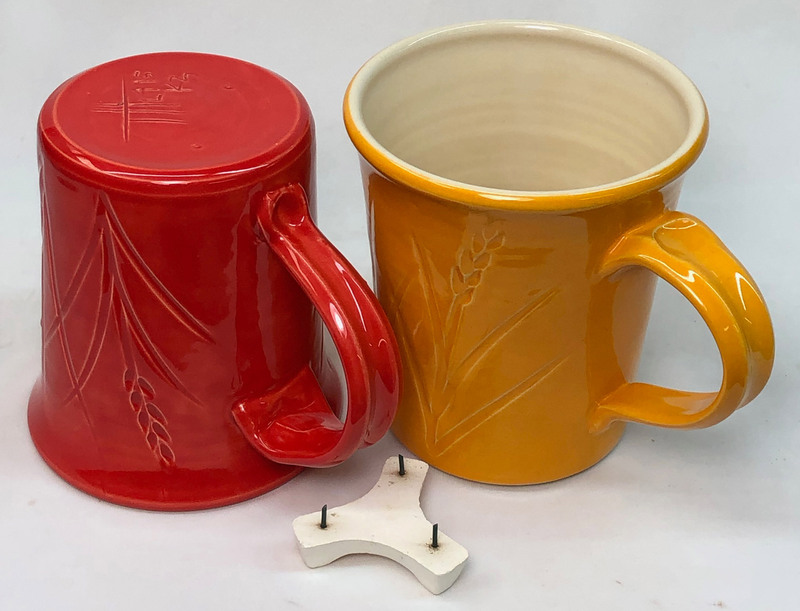 Orange is a very difficult color in ceramics. Inclusion stains are the only reliable method and universally used in industry. But you could ignore that and try a bunch of recipes online, buying exotic materials to complete each one. Maybe one will be orange enough, but will it craze or run or blister or leach or cutlery mark or crawl? Or you could put an orange stain into a transparent glaze you already know works on your clay. Or, how about trying a premixed orange at low fire? Ware can be amazingly functional and there are so many other bright colours available. If your reclaim is short and non-plastic you can make it better-than-new by using an additive of 50% ball clay and 50% bentonite. 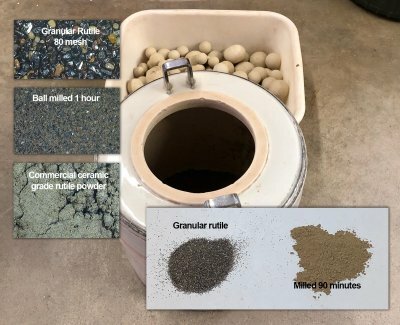 While only a few percent bentonite supercharges the plasticity of any clay body it is almost impossible to get it to mix into a wet slurry or plastic clay. But thoroughly shaking it together with ball clay (in a plastic bag) separates the super-tiny particles of bentonite between the almost-as-tiny particles of ball clay, that new powder will easily mix with water. 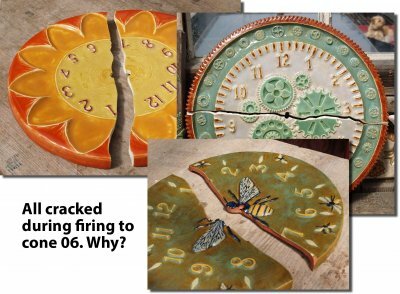 And it fires to a tan-buff stoneware at cone 6 so it won't change the fired appearance of most buff or brown cone 6 stoneware bodies. Inside is GR6-A (Ravenscrag Slip with 20% Ferro Frit 3134). Outside GA6-B (Alberta Slip with 20% Ferro Frit 3195). Cone 6 drop-and-hold PLC6DS firing schedule. By Tony Hansen. This is the G2934Y matte cone 6 recipe with a red stain (Mason 6021). The one on the left was fired using the C6DHSC slow-cool schedule. The one on the right was fired using the drop-and-soak PLC6DS schedule. The only difference in the two schedules is what happens after 2100F on the way down (the slow-cool drops at 150F/hr and the other free-falls). For this glaze, the fast cool is much better, producing a silky pleasant surface rather than a dry matte. Functional ware at low fire! Don't dismiss it just yet. These were only fired at cone 04, but they are durable enough to last some time with normal use. 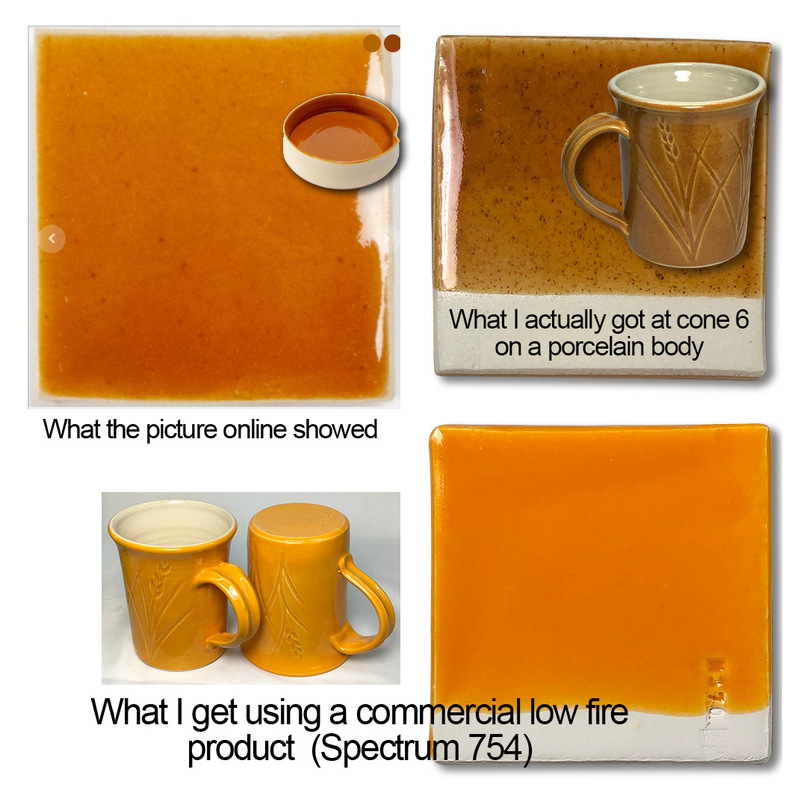 The insides have a transparent glaze (Spectrum 700), it is leadless and completely safe. These are great insulators, they keep coffee warm longer than porcelain or stoneware. The feet are glazed so they are fine for the dish washer. They are super-light, the body is made from ball clay and talc and throws really well. These shrink very little on drying (in this case less than 2% compared to porcelains which can be 8% or more). These are inexpensive to fire, only four hours to cone 04. They withstand impacts better than you think (a thin porcelain mug propagates cracks and can shatter). Colour, glorious color! 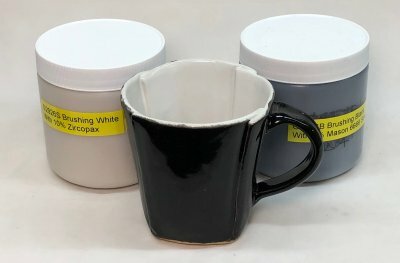 These are Spectrum Opaque low fire glazes, dozens of wild colors are available. 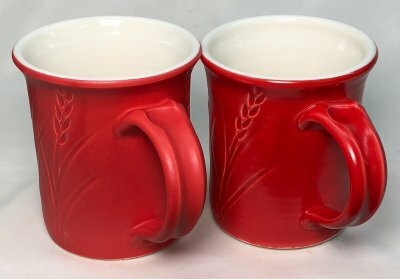 Context: Which is better for functional ware? Cone 04? Cone 10 reduction? 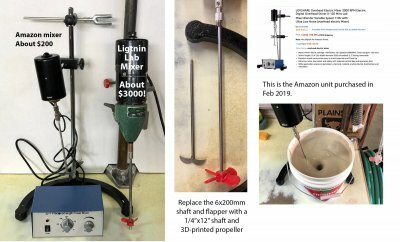 Cheap Amazon glaze mixer, how does it stack up? Make some adjustments and it is usable. First, it is very quiet and has lots of power. The plastic sliders ride smoothly and provide precise adjustability (but the plastic threads might not last). The vertical shaft is stainless steel and the cast iron base is heavy, sturdy, practical. The motor-to-shaft mounting collar is good quality (but must be tightened with a tool). It has a stepper motor that runs less than 300 rpm (not the 3000 advertised)! The timer switch will not likely last, better to leave it on and use on/off. It does not turn off completely on zero-speed setting. The propeller shaft is too short and the flapper on the end is useless in ceramic slurries. The shaft rotates opposite-to-normal direction. You have to 3D-print a large propellor (we can help you if needed), with that it will easily mix 2 gallons of thick, high-specific-gravity slurry (we replaced the 8" shaft with a 12" one). We started by adding 500 grams of the G2926B Whiteware base clear to 250g of water and 100g of Laguna gum solution. It was possible to stir all the powder in without a mixer. There were a few lumps left but they broke down overnight (yielding about 550 ml at 1.58 specific gravity). For the black we added 30g more of Mason 6666 stain (6%) and for white 50g of zircopax (10%). This increased the specific gravity to 1.63, higher than pretty well any commercial brushing glaze (if needed, there is plenty of room to add water to thin it for better application properties). The black recipe costs about 1.37 cents/ml for us to make (compared to Amaco C-1 Obsidian @ 3.92 cents/ml to buy). But the situation gets even better: If we were to add enough water to bring the specific gravity down to the 1.4 of C-1 there would be far more than 550ml. 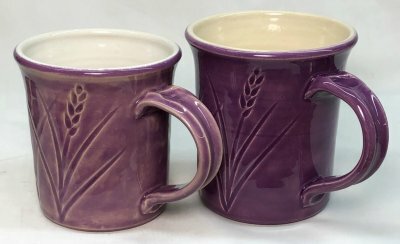 Same glaze/body. One fired flawless, the other dimpled, pinholes. Why? 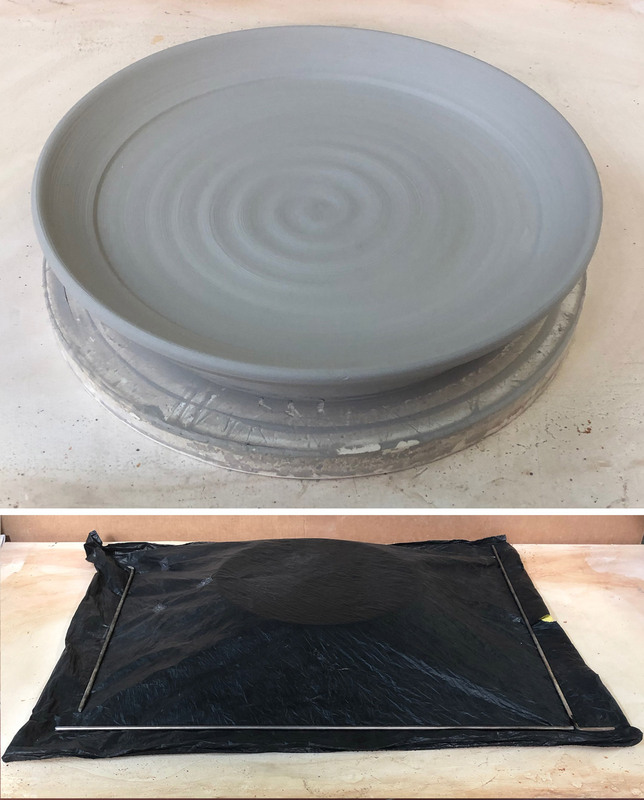 The difference is a slow-cool firing. 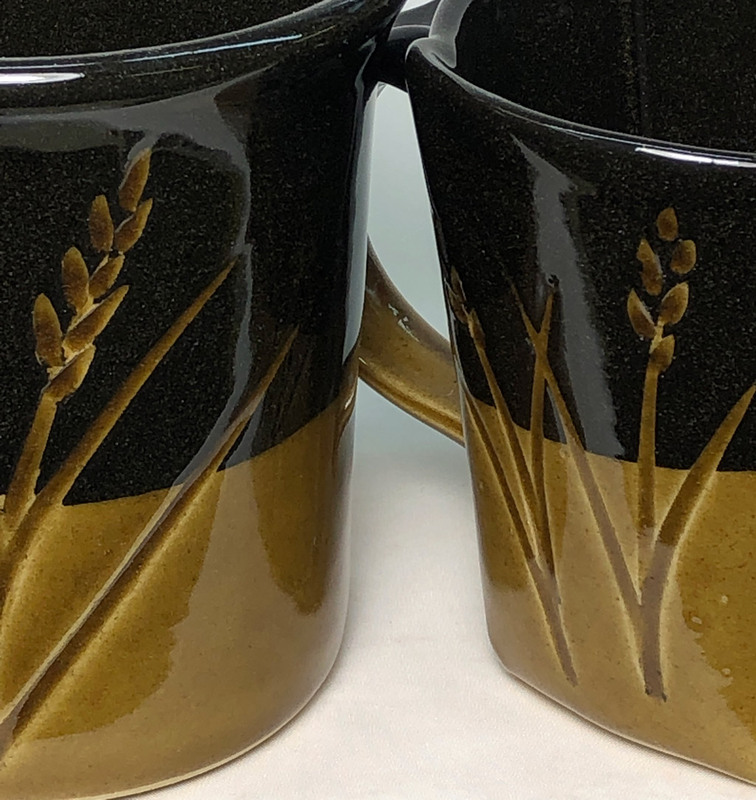 Both mugs are Plainsman M340 and have a black engobe inside and partway down on the outside. Both were dip-glazed with the GA6-B amber transparent and fired to cone 6. The one on the right was fired using the PLC6DS drop-and-hold schedule. That eliminated any blisters, but some pinholes remained. The one on the left was fired using the C6DHSC slow-cool schedule. That differs in one way: It cools at 150F/hr from 2100F to 1400F (as opposed to a free-fall). It is amazing how much this improves the brilliance and surface quality (not fully indicated by this photo, the mug on the left is much better). This contains 6% Mason 6600 black stain (Mason 6666 gives dark brown, don't use it). The base recipe, G2934, is an excellent balanced-chemistry host for a wide range of stains to produce equally stunning reds, yellows, oranges, etc. The fritted version of the recipe, G2934Y, provides an even better host. This glaze is affected by the clay it is on. The body on the right is highly vitreous, this has produced a finer texture that glistens in the light. The body on the left is a whiteware having 1% porosity (Plainsman M370). Firing schedule is also a factor, slower cooling will dull the color more. We use the PLC6DS firing schedule. Hand built. Cone 6 drop-and-hold PLC6DS firing. The engobe is the L3954B base recipe with added Mason 6600 black stain, it was applied at the leather hard stage inside and part way down the outside. 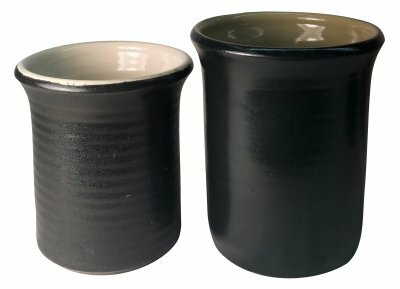 The GA6-B glaze enhances the black under it. By Tony Hansen. When you mix it right it will be thixotropic, that is, it will gel slightly and hold itself on the ware after dipping. This state can only be achieved if there is enough water for the epsom salts to do their magic. The watery nature of the slurry is nice for measuring specific gravity using a hydrometer (normally they don't float freely enough if the slurry is creamy). We normally recommend a specific gravity of 1.44 for this glaze, but in this case it seemed watery enough at 1.46. On use it will become clear if 1.46 is OK. How? It will go on the ware too thick. If that happens just add water to 1.44 and add more epson salts to gel it back up. You should be able to bend it and stretch it like you see here without any issues. If you are having problems, then please tell us how your experience is different than what you see here.